It is rare that I'm enamored with a re-recording effort, as the results are often stale, the magic of the original recordings — no matter how devoid of modern studio polish — lost in the mix. The re-recordings of classics by the likes of TESTAMENT and DESTRUCTION surely have their moments, but the enjoyment was short lived. 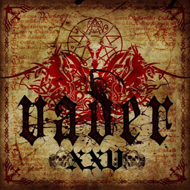 That has not been the case with VADER's 25th anniversary re-recording of demo songs and studio versions, appropriately titled "XXV". More than just a "best-of" and more than just a studio revamping, the two discs full of Polish death/thrash have been crafted with the utmost care. It gives the fans and newcomers a fantastic representation of a storied catalogue with new twists, extra touches, and a recording effort that somehow retains the raw power of the originals. Perhaps the most pressing question on the minds of VADER fans is what the re-recording has done to the sound of the earliest demo material and albums. The answer is that it has in fact made them better without killing the primal power and urgency of the originals. I never found the recordings of even albums like 1992 debut "The Ultimate Incantation" to be subpar anyway, maybe rough around the edges and not delivering the same punch as later albums, but certainly not unacceptable. A song like "Dark Age" is anything but stale, and in some ways more forceful and in your face with the new treatment. Songs from classic albums like "De Profundis" and "Litany" are simply beefier. Truth be told, I'll probably always prefer a track like "Silent Empire" in its original form, but then so would most VADER fans. That really goes without saying with most re-recording efforts anyway. That particular cut is one of several that is touched up with the arresting keyboard work of Siegmar (VESANIA) who has lent his skills to the band's latest efforts, "The Art or War" and "Impressions in Blood". And by god it works! Never fear, as his darkly majestic colorings and introductions merely add depth and atmosphere, rather than dousing the flames. Besides, this is a re-recording, not just a "best-of" cash-grab and is one of the reasons why fans will want to hear the revamped efforts. He also pens new intro "In Vaders", which opens the first disc. Along those same lines, other guest musicians are also brought along to breathe new life into the oldies and contribute to some surprises. The vocals of SEVERE TORTURE's Seth on "Reborn in Flames" seem anything but out of place, as though they were meant to be there all along. "Final Massacre", a song found in various versions on "Necrolust", "Morbid Reich", "The Ultimate Incantation", and "Litany" features bassist Novy and guitarist Mauser on vocals. The album is rounded out with a cover of TERRORIZER's "Fear of Napalm" (featuring DEAD INFECTION's Hal and Pierscien on bass and vocals, respectively) and a track called "Wyrocznia" by Polish heavy metal act KAT with vocals from Roman Kostrzewski. Guitarist/vocalist/chief Piotr "Peter" Wiwczarek states in the liner notes that "KAT was for Poland what BLACK SABBATH or SLAYER were for the West." Peter, in fact, offers a track-by-track discussion in English and Polish in the booklet, another nice touch to a professionally packaged album. One can question the reasoning behind these re-recording efforts, including the inclusion of keyboards on songs that never had them in the first place, but few could argue that "XXV" is a well-done effort and a grand way to celebrate 25 years of VADER. In other words, even if you've got most or all of VADER's albums, you'll more than likely want to grab a copy of "XXV" too. It's worth the money.